Loving it? Well then, subscribe! I'll send you a fortnightly email with all kinds of good stuff. It'll be just like we're having a cuppa together. I can't wait! 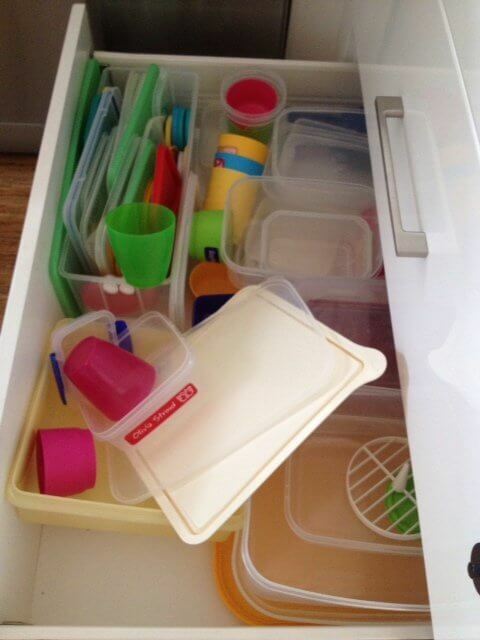 * Our Tupperware drawer – it’s wily, uncooperative and regularly in need of re-ordering (but who can be bothered?). I live in fear of it becoming jammed shut and thousands of dollars worth of mis-matched Tupperware being hidden forever like some kind of treasure just waiting for a More Organised Domestic Goddess to discover. Some days it won’t shut. * The future – I’ve had glimpses of the teenage years and they made me tremble. The roll of the eyes, the click of the tongue, the swagger of the hips all combined with a long, drawn-out sigh. I can see my future in those tiny moments and it’s not pretty. Those glimpses are like the most sinister moments in movies where you know the killer is lurking in a dark corner and you can’t warn the victim. Get out now while you still can! * The toilet – because seriously, you never know what you’ll find in there. Surely flushing should be second nature for them by now. * The grocery bill – sometimes it resembles a mortgage repayment. The docket comes swirling out of the checkout chick’s console as though it’s a copy of War And Peace. I actually hold my breath when I insert my PIN. After the word APPROVED flashes on the EFTPOS machine, I make a hasty getaway. This never happened BC. 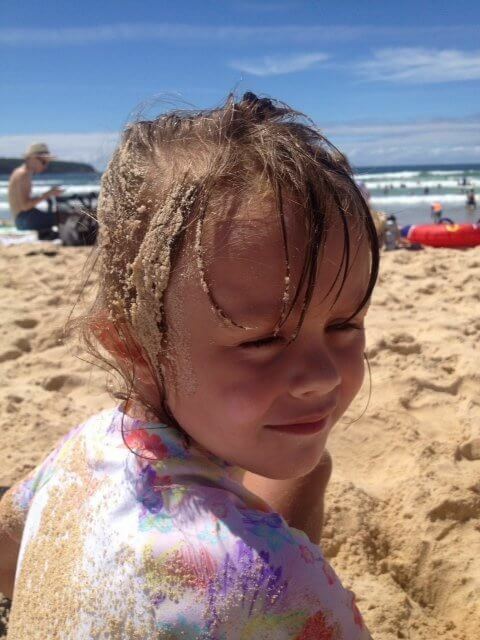 * Sand – Sophie loves sand. She isn’t one bit frightened of it. And when it’s on the beach, I’m not that frightened of it either. But when I find it on my floors, over my lounge, in my shower and through my bed I freak out. It’s fear mixed with anger – where else is it? combined with Grrr Sophie! And I know it’s Sophie I should be blaming. At the beach, her favourite thing to do is to get wet and then roll in the sand. Seriously. She lays down and makes sand angels. 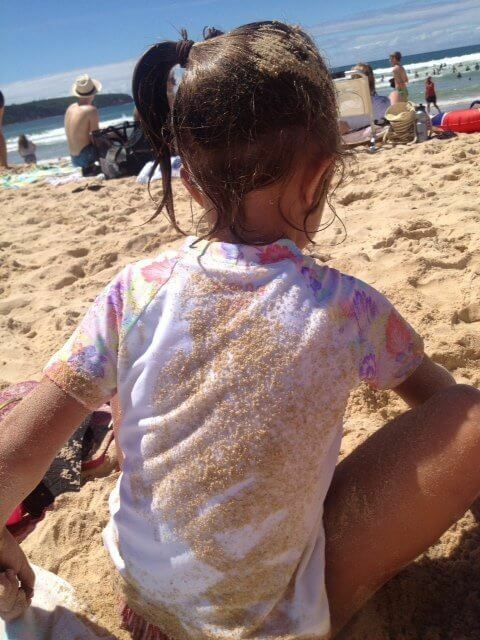 The child doesn’t stop until she is a Beach Schnitzel. If she had more fat on her we could consider getting a tub of breadcrumbs and a deep fryer. I have tried several methods of sand removal: rinsing at beach shower, rinsing under the hose, removing swimmers in the shower (Epic fail – sand everywhere). I’ve tried some dry-removal techniques as well: brushing her ever so lightly with a dustpan brush (don’t judge me), asking her to stay outside until it all falls off, making her sister rub it off her with a towel, taking her down the street and through some shops until most has fallen off (no judgement okay?). It doesn’t matter what I do, sand still makes its way into my home. And that’s what makes it scary. How is it getting in? 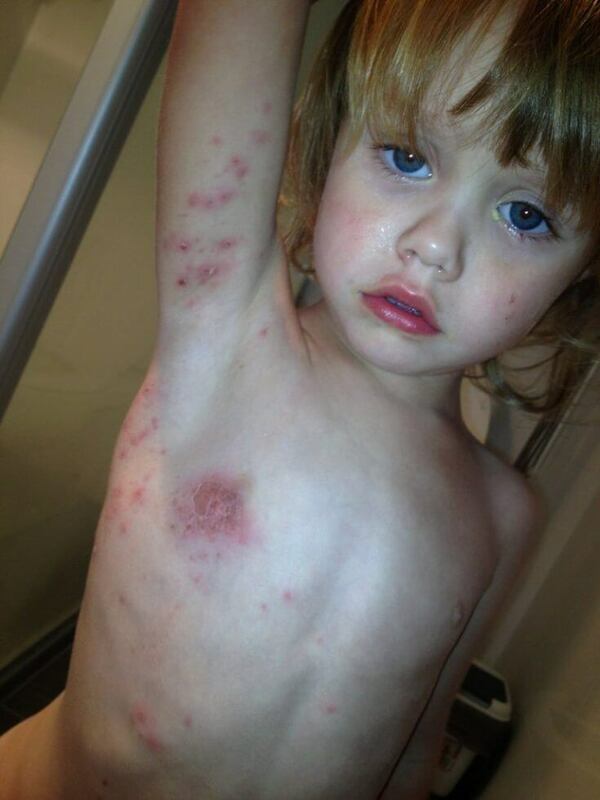 * School sores, head lice, gastro bugs and other communicable childhood diseases – there was a time, BC, when I didn’t know what a school sore looked like. Now I can spot one at twenty paces. The words “Mum I don’t feel good in my tummy,” cause my own stomach to roil with fear. Head scratching makes my blood run cold. I am not exaggerating for effect here – I got a shiver just typing this paragraph. 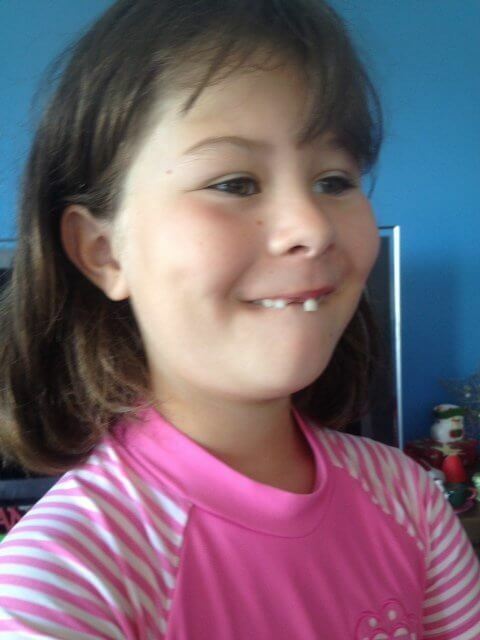 * Loose teeth – Olivia recently had one that was hanging by a thread: a juicy, bloody, frayed, gummy thread. She could perch offending tooth over her lip like she was bearing a little fang. She could twist it, shift it, spin it, slide it and wind it. Ugh gross. She caught it with her feet, impressing everyone at Mitche’s Jetty. Within an hour she was regaling strangers with the amazing tale of how she “catched a sea snake” with her toes in the sand. 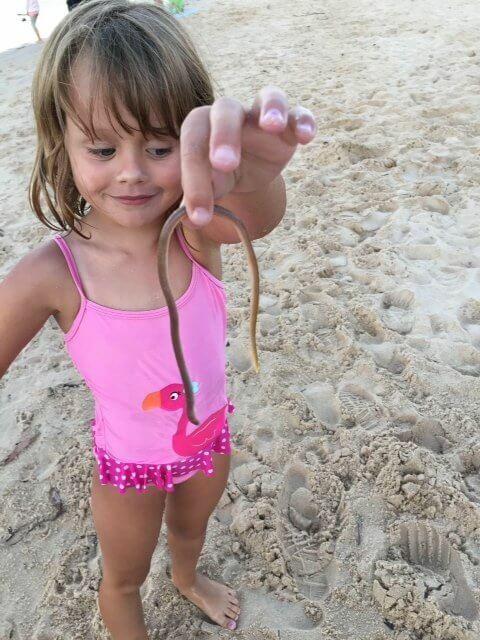 Turns out it was an eel – thank gawd – sea snakes are apparently highly venomous. Clearly – I have nothing to fear. Now don’t leave me hanging here like a big scaredy cat. What freaks you out in the land of Parenthood? Share now by leaving a comment in the box – or are you too afraid? When my boys were little the inside of pockets used to scare me! You never knew what you would find…….snotty tissues, half eaten lollie pops, even toy cars! The best was Xmas beetles, dead and smelly that had been in a hiding hole in the garden.. Corey was a little treasure……..he used to collect the tails of little skinks and keep them! Yuk!. Now they are all bigger I’m really scared……….of the inside of their cars! Ohhh that’s a good one Cyn! I can just imagine you extracting an old Chrissy beetle from a pocket. Just the thing you want to deal with when you’re about to do a load of washing! As for the inside of their cars, I hate to guess what kind of treasures you might find. Mobile bachelor pads really… good luck with that. YES! I meant to put that in the blog. Chicken nugget anyone? Children’s accidents such as stick in the eye from sword fighting (hospital and surgery). Broken tooth from trying to touch the bottom of the pool (shallow end, with face). Squishy stuff between toes because I couldn’t find shoes in the dark to make a toilet run. Going into the toilet after the boy child who is scared of spiders (it’s like a hose has gone wild in there). My Little Pony, Frozen, Care Bears and Dora on repeat. Every. Freaking. Day. All valid fears Paula. None of my kids have broken a bone… yet. I do fear that day. The toilet story about the boy child is hilarious – can’t you just picture him twisting and turning on the lookout for spiders while doing his business?! He he he. As for characters, what scares me is the marketing power they have over my girls. On a serious note the only thing I am scared of is having to bury my child. Every other fear is surmountable compared to this one. Yep. I guess that’s the top fear for every parent. Good call. I live in fear that someone will ring the doorbell after I’ve spent an hour getting the kids down for a nap. If this ever eventuate, the person on the other side of the door will be required to resettle my children. Fair call. I felt the same way when mine were littler. Valid fear. Why I have a crush on Jane Caro. What could I teach you? © Copyright 2019 G.J. Stroud.